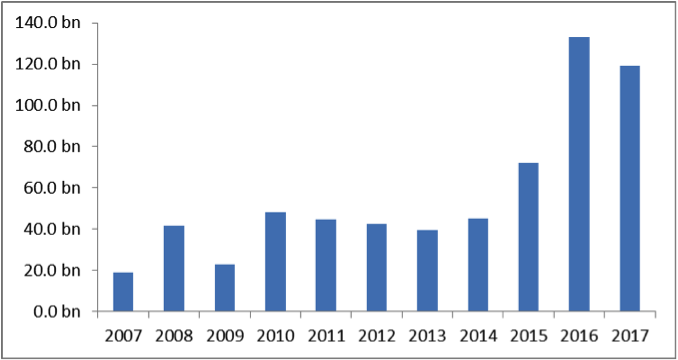 The Chinese M&A and private placement market has seen strong growth over the past decade. In 2017 the total number of completed transactions for targets based in China was up 48% on 2007. The Chinese M&A and private placement market has seen strong growth over the past decade. In 2017 the total number of completed transactions for targets based in China while down from the peak year in 2015, as well as 2016, represented 48% growth compared to 2007. On a completed deal value basis, the growth was even more pronounced at 161% for a total deal value of $295.9bn in 2017. Also notable was the increase in average deal sizes, from $72.7m in 2007 to $109.7m in the peak year of 2015, to $112.1m in 2017. 2017 was led by three deals with transaction values of $5.0bn or higher, including the $9.3bn acquisition of China United Network Communications Limited by a consortium of investors. Source: S&P Capital IQ platform as of 31/12/2017. Chart is for illustrative purpose only. In 2017, while the number of completed transactions trended lower at 3,227, representing a 27% decline from 2016, the average deal value of $112.1mm represented the second highest year by average deal size. This was supported by a larger percentage of investments into the Information Technology sector, led by Softbank’s $5.5bn investment into Didi Chuxing Technology Co., Ltd. In line with the overall growth in China market transaction activity, sponsor-backed deals for China targets have also risen since 2007 at a similar pace, backed by the formation of new China-based private equity funds and also a stronger push into China from select global PE and VC firms. In 2017, completed transactions were 727, which represented 23% of the total China deal count and an 86% increase over 2007. On a deal value basis at $83.1bn for 2017, sponsor-backed transactions grew 400% compared to 2007. Comparing 2017 to 2016, sponsor-backed transactions increased approximately 7% relative to 2016 levels on a deal count and 25% on a deal value basis, which represents an increase compared to the overall decline in China deal activity. Of the ten largest sponsor-backed deals completed in 2017, four of them are in the Information Technology sector including the aforementioned investment into Didi Chuxing. 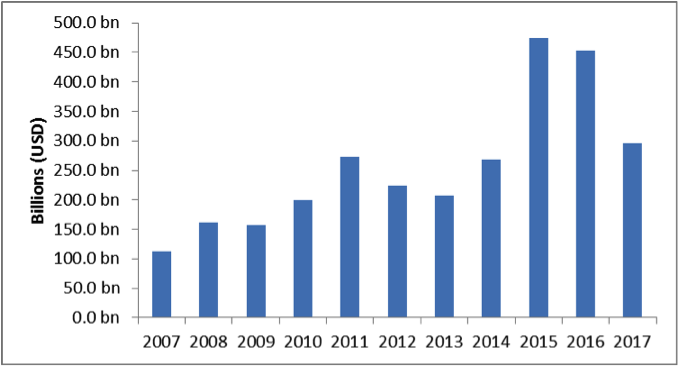 Alongside the rise in domestic activity, outbound M&A and private placement activity from China has grown steadily over the last decade, with 2016 setting a record both in terms of completed deals at 761 and aggregate transaction value at $133.0bn, representing growth over 2007 of 286% and 607% respectively. 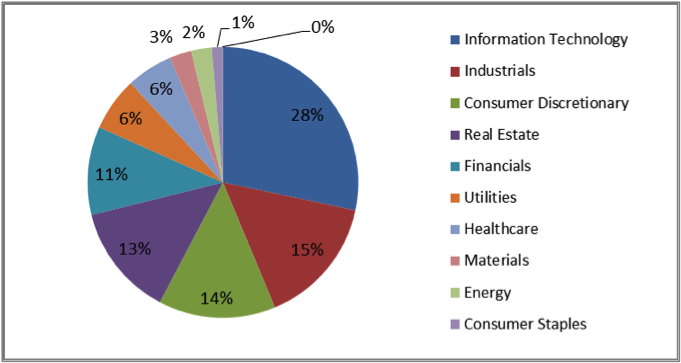 During 2016 the top sector for outbound Chinese investment was Information Technology where a combined $36.8bn was invested across 219 deals representing over 28% of overall investment by deal value. In 2017, total outbound investment from China has seen a decrease to 597 deals at $119.2bn, which represent 22% and 10% declines compared to 2016. While this decline is less than the decline for domestic activity, it may not yet fully reflect the China regulatory pressures on outbound M&A, which is more apparent in announced transaction activity rather than deal completions. During 2017, outbound investments into Information Technology reflect only a small decline of 6% to 206 deals from 219 in 2016. However, in terms of aggregate deal value, 2017 represents a substantial decrease in investment by 75% to $9.3bn. This compares to 2016 during which $36.8bn which was backed by 7 completed deals of $1bn or greater including the $8.6bn acquisition of Supercell Oy. 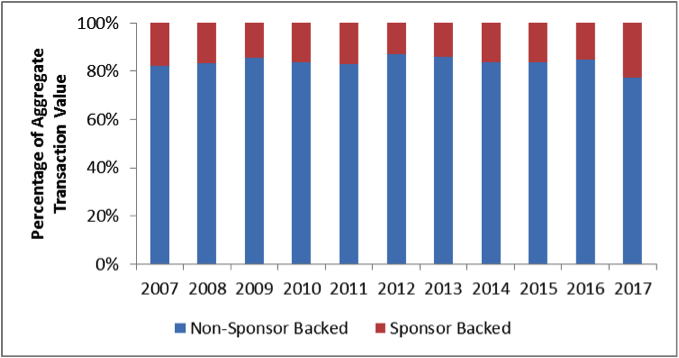 Looking through a wider lens on global sponsor-backed activity, the Information Technology sector witnessed growing attention from global PE firms over the last decade. During this period the total capital deployed into IT targets across the world grew by 40%, from $98.0bn in 2007 to a peak of $136.6bn in 2016. In 2017, capital allocated into the IT sector was $122.5bn, 13% below the same period in 2016, across 5,210 deals. In terms of where capital was invested globally, the majority of the capital has historically been invested into North American IT companies, standing at $51.8bn in 2017 across 2,272 new deals. This was a decline from a strong 2016 for North America-based IT targets, that attracted a record $77.6bn of new money from global GPs. IT companies in APAC and EMEA, have still been lagging behind with $37.4bn and $32.3bn, respectively. Pushing EMEA out of the second spot in terms of invested capital since 2015, APAC-based targets have been attracting more interest from global GPs. 2017 recorded 6% less capital invested into the IT sector in Asia compared to 2016, ($37.4bn to $39.6bn). Worth noting that there has been a clear shift in terms of where the largest deals were recorded geographically over the past few years. Looking at the top five IT deals globally on an annual basis since 2010, 2017 was the first year United States-based targets were not present in the leading ranks. Since 2012, China has started to feature more prominently, overtaking the US for the first time that year with a $4.1bn deal compared to the largest US deal of just $1.6bn. In 2017, China featured three of the top 5 deals globally, placing first, third and fourth, totaling $13.5bn of new capital for the region from just these three deals. Focusing in on the deals, the largest purchase globally over the last two years was the Chinese Internet Software and Services company, Qihoo 360 Technology Co. Ltd., which was acquired for $9.9bn in cash with 27.2x EBITDA purchase multiple. Continuing this trend, 2017’s largest deal was also completed in China, with the previously mentioned deal of SoftBank’s Private Equity investment arm providing US$5.5bn of funding to Didi Chuxing Technology Co., Ltd. It is clear that while APAC does not attract the same number of deals as other regions, it offers larger opportunistic targets which global GPs have been eager to purchase at a record capital.